I was actually first made aware of this movie through a company that offered to allow my site to host a giveaway for the movie. I thought it looked like a lot of fun, had a couple recognizable names in it, and it was based on a graphic novel, so I decided I would give it a shot and I was not disappointed. It’s got great action, a great visual feel to it, and even a bit of T&A. There’s even some interesting twists and turns along the way to keep things interesting. The acting’s not going to win any awards, but that’s not surprising for this type of movie, it has a great grindhouse feel to it, but it’s much more stylish and sleek with either a decent sized budget, or someone who knows the right way to stretch a small budget. It looks great, sounds great, and I had a great time watching it. The movie takes place in a dystopian future where the big corporations went to war against each other, for some reason, and left the world a desert wasteland. A council came together to bring a sort of order to the world by taking out these corporate leaders and gave rise to Bounty Killers, which are exactly what they sound like, bounty hunters who put the dead into dead or alive, oh and there is no “or alive” in the equation anyway. Bounty Killers are the celebrities of this future and the hottest celebrity is Mary Death. And her rival/occasional begrudging partner is Drifter. Things go sideways when a bounty is placed on Drifter’s head calling him out as a previous executive and he goes on a dangerous journey to confront the council and appeal his judgement. The plot is surprisingly complex for a movie of this type, but everything is pretty clear as the movie goes along and there’s plenty of action set pieces along the way. Every ten to fifteen minutes it seems there’s another bloody gun battle, and they are all pulled off with plenty of choreography and plenty of blood and gore. Whether it’s Mary Death using her boot spurs to slice open someone’s neck, a white collar criminal getting his head smashed with a giant chain, or someone’s head getting split open with an axe. The death scenes are almost always looking for a different and interesting way to split someone apart, with the most amount of blood possible, and it’s all done with that grindhouse style where it’s not about the horror gore, instead it’s more about spewing all sorts of bright red blood. The characters themselves are pretty well developed with intertwining backstories that come with occasional flashbacks. There’s no surprise that Drifter and Mary Death have an on again, off again relationship with occasional bouts of trying to kill each other. Drifter is the typical man of few words who has a mysterious past, and Mary Death is just about the same. There’s also a comic relief in the form of what they call a gun caddy who is a fan of Drifter while everyone else has moved on to Mary Death. Unfortunately, he is the worst part of the movie, he is constantly yelling and getting himself into trouble, and he has the most annoying voice. And while he is supposed to be comic relief, he ends up being annoying more often than he is being funny. He does have a few good moments to shine, but they are few and far between and most of the time you just wish that he would end up on the wrong side of a shotgun. The visual design of this movie is one of the highpoints for me. The scene transitions are done with animation that throws a nod to the graphic novel style and helps sell the fact that it is actually based on a graphic novel. 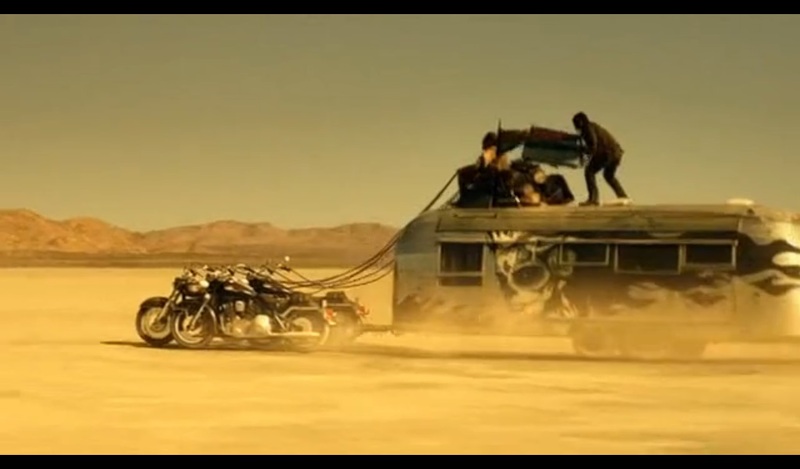 Another high point are the Gypsies, a Mad Max inspired group of chaotic anarchists living in their camps in the desert. Their faces are all painted similar to the Day of the Dead and each and every one shown in this movie is absolutely gorgeous. Their vehicles are also designed with great art designs on the side and one of the most ridiculous ideas for a stagecoach I’ve ever seen. It’s basically a Winnebago with two motorcycles attached to the front of it that they ride on the top with reigns tied to the motorcycle handles as if they were horses. It’s probably a good time to bring up the humor in this movie, which I absolutely loved. From the ridiculous stagecoach that I already mentioned, to what they end up finding inside the refrigerator, a six pack of Pabst Blue Ribbon beer. Yes, in the future the surviving beer of choice and the holy grail of beers as it were is the hipster’s choice of PBR. Honestly, even the entire premise of having the villains of this movie be guys wearing nice suits and ties just trying to make a white collar living behind a desk. It feels like a hint of the whole 99% movement, but still with enough cheek to it that it’s more humorous than social commentary. There’s also a couple familiar faces that are pretty fun to see when they show up, including Gary Busey as one of those white collar criminals and Beverly D’Angelo as the madame of a brothel called the Thirsty Beaver that used to be a regular haunt of both Drifter and Mary Death, but is now basically deserted after her best girls left for another town. And while he’s not quite as recognizable of a character, I also enjoyed seeing Abraham Benrubi as Drifter’s informant that helps them get across the radioactive badlands, also helping play up the whole PBR angle which they use to acquire his services. Bounty Killer never takes itself seriously, and that’s something I loved about the movie. But when it does get down to business, it lights up the screen with flashy, frenetic, and ultra violent action sequences that are worth the price of admission alone. It’s not a deep movie by any means, but if you’re looking for a fun way to spend an hour and a half that reminds me a little bit of Hansel and Gretel: Witch Hunters, only better, than this is very much a worthy choice. I had a blast with it and am glad I got wind of it and was able to give out a free copy of it to a lucky winner. Until next time, this has been Bubbawheat for Flights, Tights, and Movie Nights. Posted on September 29, 2013, in 10's movies and tagged film, gore, movies, review. Bookmark the permalink. 10 Comments. Will do, thanks for stopping by! Thats not cool, man. The gun caddy was funny. Haha, glad you enjoyed him. He did have his moments, but he just didn’t click with me. Thanks for stopping by! Nice review, Bubba. Glad to hear it’s enjoyable, since I’ll be receiving a copy of it myself before too much longer. Yeah, I saw that you won over on Silver Emulsion, congrats, curious to hear what you think of it when you get your copy. Thanks. Hopefully it’ll get here before too much longer; would be nice to slot it into November. Glad it went to someone who enjoyed it, I thought it was a fun movie that more people should see. Always love sharing the smaller movies out there.